A half brother to Champion 3yo Filly SAMANTHA MISS! This colt just oozes class and he is bred to be every bit of a Classics type horse as his older half sister Samantha Miss - a triple Group 1 winner of the VRC Oaks and Flight Stakes. By a young stallion who is producing black type horses our of a mare who is by Zabeel. Derby Anyone? Tavistock x Milliyet colt from Dalziel Racing on Vimeo. 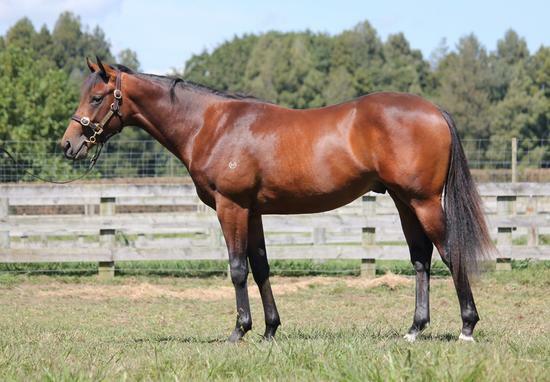 Lot 382 NZ Premier - Tavistock x Milliyet - Final PDS from Dalziel Racing on Vimeo. TAVISTOCK (NZ) (Bay 2005-Stud 2010). 6 wins-1 at 2, Waikato Draught Sprint, Gr.1. Champion Sire in Hong Kong in 2015-16. Sire of 223 rnrs, 144 wnrs, 17 SW, inc. Werther (HKJC Audemars Piguet Queen Elizabeth II Cup, Gr.1), Tarzino, Tavago, Volkstok'n'barrell, Tavidream - Circuit Glory (H.K. ), Hasselhoof, Hiflyer, Tomelilla, Gobstopper, Pacorus, Infantry, Avisto, Longchamp, Nymph Monte, Won Won Too, Tavy, Titanium, SP Milseain, Salsamor, etc. Sun Force. 2 wins-1 at 2-at 1600m to 2018, Singapore TC Class 5 H., 3d ATC TAB Betting Season H., Singapore TC Class 5 H.
Sammy's Girl. Winner at 1350m, 3d ATC Sydney Children's Hospital 2YO P.
The Greatest. Winner at 1100m in 2017-18 in Aust. Hurriyet (f. by Redoute's Choice). Winner at 1200m, 2d SAJC Morphettville Guineas, L, 3d MRC The Age Good Food Guide P.
Super Choice (g. by Choisir). 5 wins from 1200m to 1600m, A$83,500, STC Canterbury BMW & Nick Scali Furniture H., 2d STC Great Food at The Freeway H., 3d NSW Tatt's RC Royalrandwick.com H.
Rose of Kentucky (f. by Anabaa). Winner at 1200m, BRC Glenlogan Park Stud H., 2d BRC Channel Seven H., Brc.com.au P.
Nationality (g. by Commands). 2 wins at 1150m, 1200m in 2017-18 in Aust. Championmet (c. by Redoute's Choice). 2 wins at 1450m, 1600m in Aust. Lady Iveagh (f. by More Than Ready). Winner at 1000m in 2016-17 in Aust. CRONUS (Zabeel). 11 wins from 1600m to 3200m, NZ$174,425, A$793,460, HK$140,000, SAJC Adelaide Cup, Gr.1, Hawke's Bay Cup, Gr.2, GCTC Prime Minister's Cup, Gr.2, Manawatu RC Awapuni Gold Cup, Gr.2, BTC Chairman's H., Gr.3, SAJC West End Draught S., Gr.3, ARC Ellerslie Function & Convention Centre H., BOP RC Trackside Video Sales H., Hawkes Bay Davmet H., Taranaki RC Equinet International Welter H., WRC Capital Development Agency H., 2d AJC Queen Elizabeth S., Gr.1, Moonee Valley Gold Cup, Gr.2, GCTC Prime Minister's Cup, Gr.2, QTC PJ O'Shea S., Gr.2, Rotorua Cup, Gr.3, QTC Eagle Farm S., L, Hawkes Bay Fayette Park Stud H., ARC Lindauer H., Frank Casey Formal Suit Hire H., 3d ARC The Oaks Stud Classic, Gr.1, Moonee Valley Gold Cup, Gr.2, VRC Queen Elizabeth S., Gr.2, BTC Chairman's H., Gr.3, WRC Trentham S., Gr.3, 4th ARC New Zealand S., Gr.1. PRAVANA (Anabaa). 5 wins from 1200m to 1600m, A$160,425, AJC Aspiration H., L, Liverpool H., 2d STC Millie Fox S., Gr.3, BTC Mater Little Miracles H., 4th STC Coolmore Classic, Gr.1, AJC Emancipation S., Gr.2. Producer. ARTISTRY (Shamardal). 8 wins from 1100m to 1600m, A$562,810, to 2016-17, ATC Maurice McCarten H., Gr.3, Newcastle Newmarket H., Gr.3, VRC Hong Kong Jockey Club S., Gr.3, ATC Blacktown Workers Club Group H., Hyland Race Colours H., TAB Rewards H., First Excelebration Yearlings H., 2d BRC Dane Ripper S., Gr.2, City Tatt's RC Nivison S., Gr.3, ATC Cellarbrations H., 3d ATC Sapphire S., Gr.2, 4th ATC Wenona Girl H., Gr.3.